Tagalog in a Flash: Volume I is an excellent new Tagalog language learning resource for beginning students and a great way to study Tagalog vocabulary. Tagalog is the national language of the Philippines and the beloved language of the second-largest Asian-American ethnic group. With a full range of features to help beginners and intermediate learners, these Tagalog flash cards are an excellent learning tool for anyone who wants to master Tagalog (also known as Filipino). 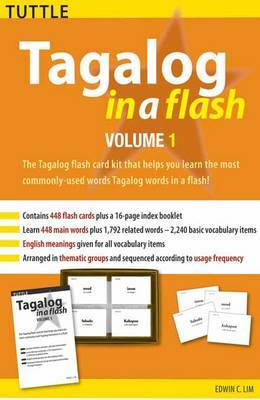 Containing 448 flash cards of the most commonly used Tagalog words and phrases, along with sample sentences, handy indexes and a guide to using the cards for most effective learning, Tagalog in a Flash Volume 1 delivers. Contains 448 flash cars plus a 16 page index booklet. Learn 448 main words plus 1,792 related words, phrases and expressions. Pronunciation and accent marks given for all 448 main words. Arranged and sequenced in thematic groups and usage frequency.